At EBPC Law, our Belleville personal injury lawyers have helped countless accident victims in the community and recovered millions of dollars in compensation for victims and their families. EBPC Law has a proven track record of success and comes highly recommended by local residents. 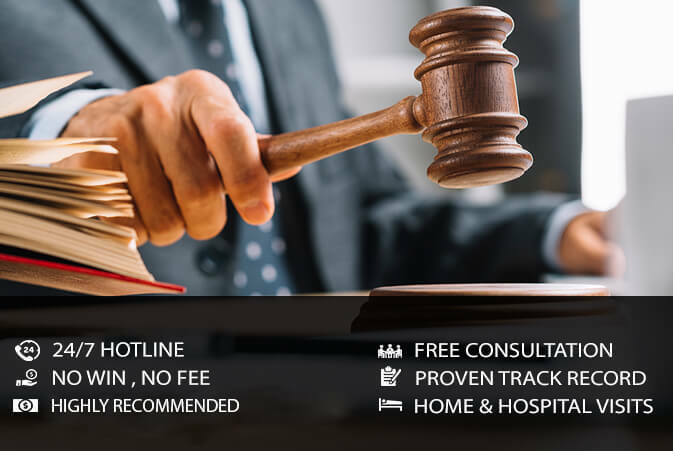 We are experts in fighting for the rights of victims injured in motor vehicle accidents, public transportation accidents, motorcycle accidents, pedestrian accidents, slip and fall accidents, product liability, dog bites, and long-term disability claims. EBPC Law also specializes in accidents that result in brain injuries, spinal cord injuries, orthopaedic injuries, and injuries resulting in chronic pain and psychological trauma. Our Belleville personal injury lawyers are proud members of the community and take pride in helping injury victims get the compensation that they deserve. Having extensive trial experience allows EBPC Law to level the playing field when dealing with an overly aggressive opposing legal team. We have never backed down from a court battle and will not be intimidated into accepting anything less than the best for our clients. No matter where or how you were injured, you deserve to be compensated. Contact us for a free consultation, and protect your rights. We will ensure that justice is served and that you receive all of the compensation you are entitled to. We work on a contingency basis, which means that you do not pay unless we win. Thousands of people are injured due to slip and fall accidents, auto accidents, or maybe even dog bites, product malfunction and negligence. Serious accidents result in chronic pain, broken bones and mental trauma and in some cases, it may be fatal. For clients, to get back to their normal life, includes medical treatment, rehabilitation and after-care services. They may be under immense financial strain with mounting medical costs, loss of wages and future cost of rehabilitation and treatment. Contacting EBPC Law’s team of personal injury lawyers in Belleville can be of help. We know that you deserve compensation to compensate the injuries that you received. We are legal experts when it comes to personal injury cases and have successfully brought claims against guilty parties, negotiated with insurance companies to help our clients get the maximum payments. We have a successful track record of winning cases. Even though legal assistance and representation might be the last thing on your mind when you or a loved one has been seriously injured, it is essential to call EBPC Law. To accommodate your requirements, our Injury Lawyers in Belleville make hospital and home visits to ensure that you are aware of your rights and can help you get the assistance you need. The compensation depends upon the level of injury and loss. You or a loved one is entitled to accidental benefits that covers but is not limited to loss of wages, medical treatment, rehabilitation and attendant care. In some cases some optional coverage are provided for housekeeping and care giving benefits. In case, the injuries are catastrophic leading to partial or complete disability, the coverage and compensation increases accordingly.